SA was encouraged by an improving human rights situation in Zimbabwe, a foreign affairs official said on Monday. 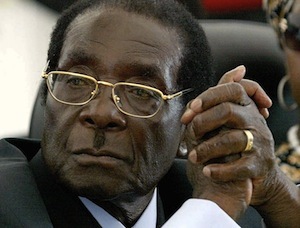 Foreign affairs director general Ayanda Ntsaluba said the government would continue to encourage Zimbabwe’s leaders, Prime Minister Morgan Tsvangirai and President Robert Mugabe (pictured), to stick to their power sharing agreement made in February. President Jacob Zuma met with Zimbabwe’s leaders at the weekend. He attended an agricultural show where he reported to have said that he was “encouraged” by what he had seen. Zuma said the country’s leaders had agreed that differences needed to be resolved speedily to “help restore confidence in the country and the economy”. Ntsaluba said it was important for Mugabe and Tsvangirai to sort out their differences as they needed to encourage international investment. He said there were still “issues” in Zimbabwe — about land invasions, parliamentarians being arrested and the failure to install a deputy minister of agriculture.